Travel back in time to help 1950s dad handle a day in. Click here to play! The house is a mess, the baby needs changed, and the dog is running amuck. Can you help dad fix things up before mom gets home? You’ll need to keep a close eye on dad in this game, as he doesn’t know what’s going on. He only appears on selected reels, but he acts as a substitute that will replace most other symbols to help you bring in more winning combinations. Watch out for mom’s icon as well. She’ll be calling to check in from time to time and if you can spin two to five of her across the reels you’ll gain up to 6000 times your line bet. Stop the dog from tearing up the laundry by spinning him across the lines. Two to five will get you up to 2000 times your line bet. There are also washers, vacuums, boiling pots, ringing phones, teddy bears, rubber ducks, bottles, and pacifiers to help you bring in the big wins. Dad needs the most help with the baby. Spin two to five of the scatter baby symbols to get up to 100 times you total bet. 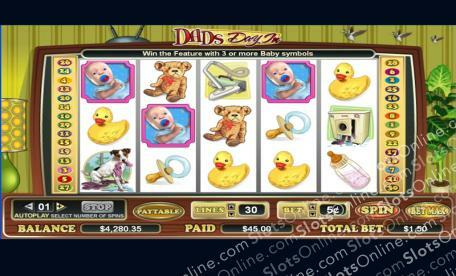 If you can get three or more babies anywhere on the board, you will trigger the Baby Feature for more chances to win big. So, help 1950s dad get a grip on a day at home and you’ll be sitting pretty on a substantial fortune! The screaming baby is a scatter symbol. Spin two to five anywhere on the board to multiply your total bet by 2, 5, 20, or 100 respectively. Dad is a substitute. He only appears on reels 2, 3, and 4, but he will substitute for all other symbols (excluding scatters). If you can spin three or more baby symbols anywhere on the board you will trigger the Baby Feature. You will get to roll the dice three times to move the baby around a board to earn prizes. You can get free spins or cash bonuses.